Instant Digital Download - $2.00 - Includes both color and black and white. 2. In class have your children color the disciples. If they are making the stick puppets, have them cut the patterns apart and glue them to craft sticks. If they are making the fan-folded display, have them cut out the rows of disciples, tape or glue them together, and then fan-fold them to make the display. This activity can be used in different ways. 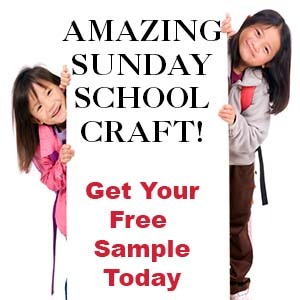 You can glue the disciple patterns onto craft stick to make puppets that can be inserted into the appropriate slots or you can just have your children glue the pictures onto the file folder. You can have your children make their own file folders or make one or two for your class to use in groups. 2. Cut the bottom edge off the top file folder page and the top edge off the bottom file folder page. Use an Exacto knife or box cutter to cut slits on all the dark lines. Glue the pages onto the file folder around the edges. 3. 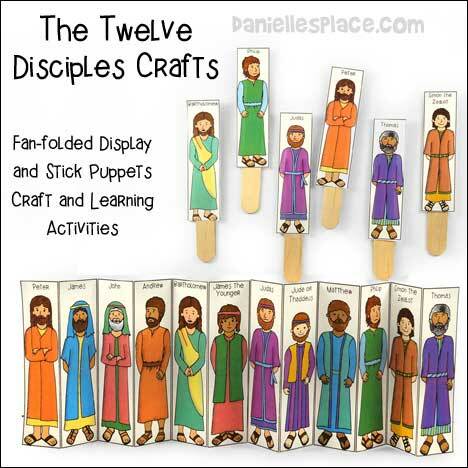 In class have your children color the disciples, cut them out and glue them to the sticks. 4. 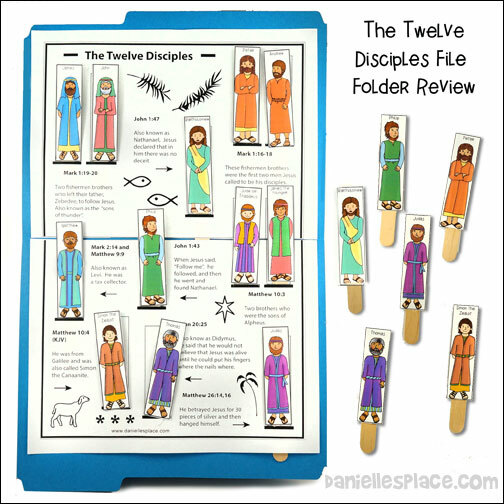 Have your children look up the Bible verses on the file folder sheets to discover which disciple is described and then place the appropriate disciple in the slot. Make a boat with the twelve disciples in it. 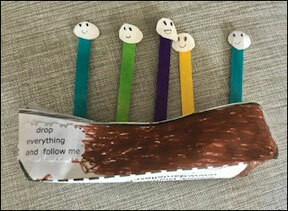 Marie Felix sent in this picture of the disciples in a boat her studends made. 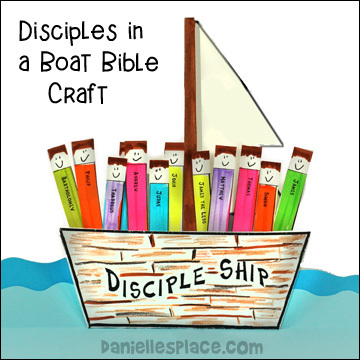 She glued the Bible verse on the bottom of the boat and had her students draw faces on paper circles and glue them to colored craft sticks. The craft sticks are taped together so that when they are pushed together from the sides they fan fold up into a compact stack of sticks for storage. Unfold the stack and the disciples appear standing next to each. 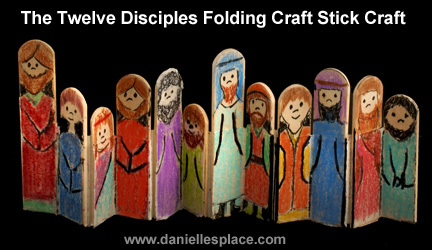 Children will enjoy drawing each of the disciples and then writing the names of the disciples on the back of the sticks. 1. This technique will create two sets of twelve people. Place two sticks together, side by side, and tape them together covering both the sticks with the tape. You don't have to cover the rounded ends of the sticks. If you line the sticks up so that they aren't even on the side, you will have people of different heights. 2. Turn the two sticks over so that they are diagonal to you. 3. Place another craft stick next to and below the two sticks that you taped together. Use another piece of tape to tape the bottom two sticks together. 4. Turn all three sticks over diagonally and place another stick at the bottom of the row and tape the last two sticks together. Keep going until you have twelve craft sticks in a row. 5. You can also cover the first and last stick in the row by placing tape over the stick and then folding it back over the stick. It is easier to write on the tape than the craft stick. The ink soaks into the sticks and blurs. 6. Cut a straight line down the row of craft sticks. It is much easier to cut the craft sticks with the tape on them because the craft sticks don't crack. Use a good quality scissors to cut the sticks. Children can use permanent markers, pens, or colored pencils to draw the disciples faces, hair, and clothes on the sticks. 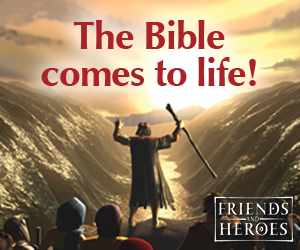 Have them write the disciples' names on the back of the sticks. If you don't have time to make all the 3D boats you can use this time-saving pattern sent in by Gina Cheeks. Optional: Replace hand-drawn faces with small, smiley face stickers. 1. Before class print out the patterns and cut them out. Do not cut the disciples apart yet. 2. In class have your children color the front and backside of the boats. 3. Give your children white printer paper to cut out triangle shapes for sails. If you have very small children cut them out for them before class. 4. Give each child one straw and help them tape the sail to the top of the straw and tape the bottom of the straw to the inner part of backside of the boat. 5. Give one disciples pattern to each child. Instruct the children to draw a smiley face on the top of each disciple shape, or use smiley face stickers instead. Encourage your children to use different colors to color each of the disciple’s clothes. 6. When they are finished coloring, cut the group of disciples into individual strips. 7. 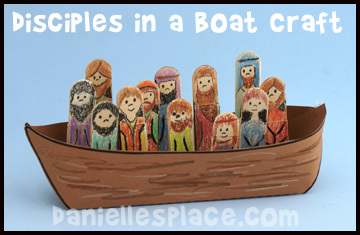 Help your children glue or tape the disciples into the boat so they don’t fall out.